Characteristics: Made from 100% Bourbon oak aging barrels. 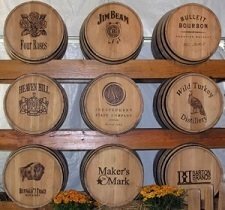 During the aging process, the Bourbon whiskey is drawn in and out of the wood giving it its distinctive color and flavor. A portion of whiskey remains in the wood after the barrels are emptied. Some of these barrels are made into Bourbon Wood Smoking Chips or Chunks. These will add the distinctive flavor of Sweet Bourbon to all your grilled foods. Bourbon's general flavor profile can be characterized as having big vanilla, oak and caramel notes. Pair with: Good with beef, pork, lamb, poultry, and fish.